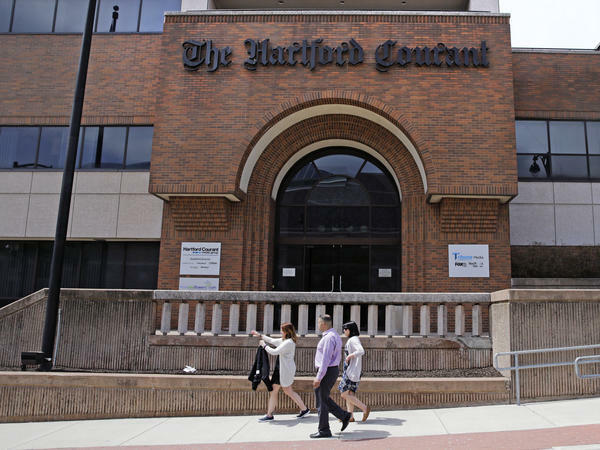 Journalists at Connecticut's Hartford Courant newspaper, which is owned by Tribune Publishing, are petitioning to unionize. Members of the Hartford Courant newsroom are moving to form a union, NPR has learned. It's the latest Tribune Publishing newspaper where journalists have been pushing to organize. Journalists at the Hartford, Conn., paper said Monday they have filed a petition for a union election with the National Labor Relations Board while also asking Tribune Publishing to voluntarily recognize the union. Nearly 80 percent of eligible staffers signed union cards saying they want to be represented by the Providence Newspaper Guild, a local chapter of The NewsGuild-CWA, the organizers said. The union would cover about 60 reporters, editors and photographers at the Courant. "In my short time in the newsroom, I've seen our staff decimated and demoralized by buyouts and layoffs," said Kathleen McWilliams, who has been a Courant reporter since 2015. "I've watched our workloads increase without commensurate compensation and I've grown deeply concerned as my colleagues and I struggle to maintain the quality of our publication while corporate managers take home $5 million bonuses." Dominic Amore, a Courant reporter for more than three decades, said: "We hope to move forward with a relationship based on mutual trust and respect and to secure the necessary tools to succeed." The unionization drive comes amid continued turmoil at Tribune Publishing, which has been the focus of sale and merger talks. Last month, the newspaper chain announced the departures of its CEO and the two top officials of its digital arm. Copyright 2019 NPR. To see more, visit https://www.npr.org.